Topics: Send, Tweet, Limousine Packages, & Pget Directions. dns1.name-services.com, dns3.name-services.com, & dns2.name-services.com are some of its 5 Nameservers. Amazon.com Inc (Virginia, Ashburn) is the location of the Apache server. 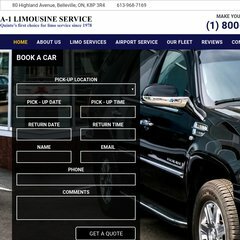 A-1limousine.ca's server IP number is 50.16.240.0.